Magnetic fields, even weak ones such as that of the earth, exert a magnetic force. Magnetic forces are experienced by some objects but not others. But what causes magnetism in the first place? The answer is quantum mechanical in nature, and relates to an idea we discussed when we talked about the spin-statistics theorem. Recall that fundamental particles are indistinguishable, meaning that if we have two electrons and two available states, we cannot tell the difference between a system where electron 1 is in state 1 and electron 2 is in state 2, and a system where electron 1 is in state 2 and electron 2 is in state 1. In fact, we can’t even figure out which is electron 1 and which is electron 2; mathematically they are indistinguishable. This, of course, relies on the particles having identical physical properties such as charge and mass, but all electrons do. Another way of saying that particles are identical is to say that you can’t tell the difference if you swap two particles, which physicists call exchange symmetry. Mathematically, it becomes necessary to write equations for multiple particles so that the equation is not modified by exchanging the particles, and this adds a term due to the exchange interaction. We can think of the exchange interaction as another factor affecting the landscape of energy available to the physical system, much like gravity or electrical interactions are factors. Thus, how to minimize the energy of the system depends on the exchange interaction. And it turns out that for some materials, the exchange interaction term causes a system with aligned spins to be lower energy than a system where the spins are randomly oriented. This is the origin of ferromagnetism, a property of objects that are permanently magnetized. Their spins align to minimize energy, creating a magnetic field that can interact with other magnetically sensitive objects. Some materials are susceptible to magnetism without being permanently magnetic, which usually occurs because small regions of the material magnetize but the regions never combine to create a material-wide magnetization. This is often the case with alloys that include iron or other magnetic materials, and the regions of magnetization are called domains. 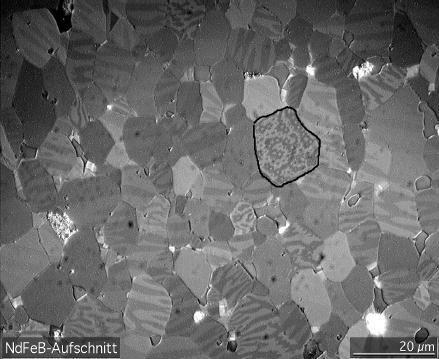 (Magnetic domains in a rare earth magnet are shown in a microscope image below.) So when you put a magnet on a refrigerator, you are placing a permanent ferromagnet on an alloy and aligning a small region of magnetic domains, creating a force that holds the two together. But the magnet can’t align the spins in a wooden cabinet door, because other terms besides the exchange interaction are more important in that material, so magnets won’t stick to wooden objects. The polarity of magnets, which are usually described as having a north and a south pole, also stems from the aligned spins. Spins aligned in opposite directions, say one pointing north and one pointing south, are generating oppositely oriented magnetic fields. This is a very high energy configuration, as you know if you have ever tried to hold the south ends of two bar magnets together. But rather than one magnet reordering the other, the magnetic forces generated push the magnets apart. You might be wondering, is there any way to change the magnetization of a ferromagnet? And actually, there is. While the exchange interaction is one factor controlling the configuration of many particles together, another factor is more mundane: temperature! At high temperatures, the high ordering of all the spins being aligned costs more and more energy to maintain, because there is plenty of thermal energy jostling the spins around. This is why sometimes people talk about ‘freezing in’ magnetism, because if you place some high-temperature materials with unaligned magnetic domains in a magnetic field and then let them cool, they will stay magnetized even after being removed from the magnetic field. And, conversely, if you melt a ferromagnet, it loses its magnetic alignment (but not its fundamental propensity to magnetize, which will return as soon as it cools back down!). Compass needles are also ferromagnets, but the origin of the earth’s magnetic field is more complex, and ties into the use of magnetism in circuits. Next time! This entry was posted in Physics and tagged electromagnetism, magnetism, physics, quantum mechanics, science. Bookmark the permalink. Great explanation! I hope that you sent a copy to the Insane Clown Posse.